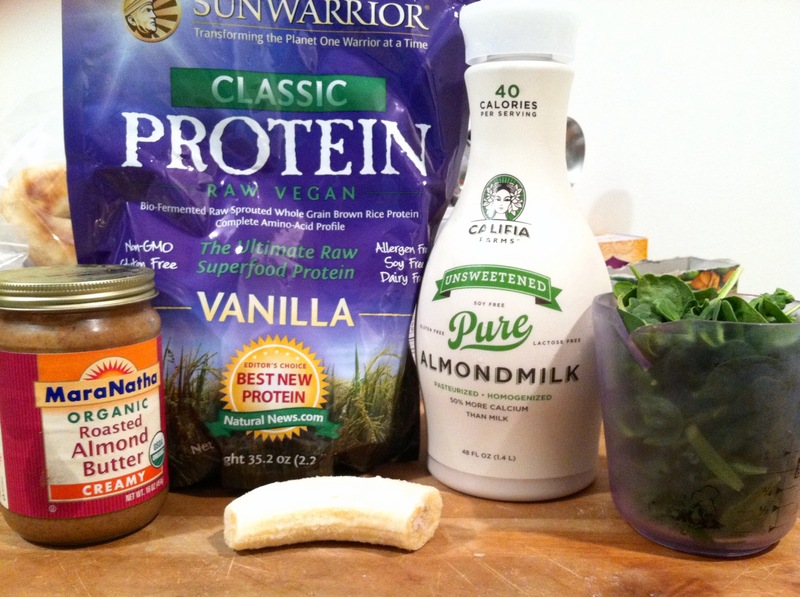 Lately I’ve been making myself a protein smoothie with my favorite raw vegan protein powder, Sunwarrior’s classic vanilla protein powder, after doing a hard workout in the morning. My latest smoothie with this protein powder has become one of my favorite smoothies I’ve ever made because it’s a combination of a green smoothie with the protein powder. 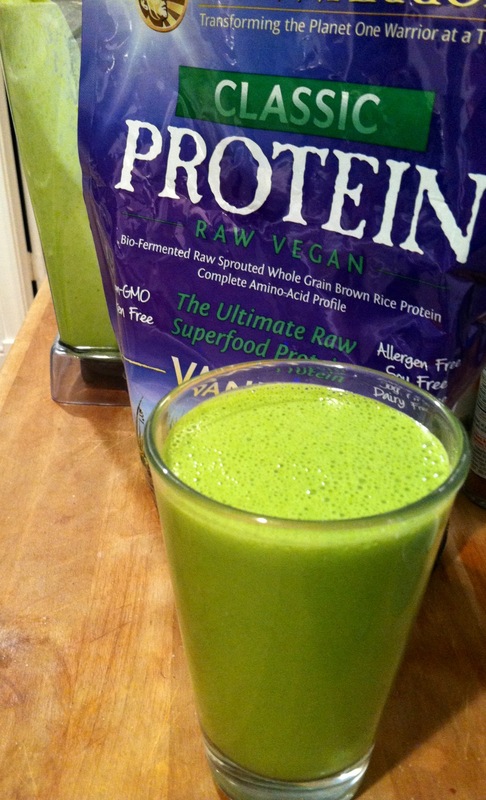 Combining banana, almond milk, spinach, almond butter and the protein powder makes this incredible, creamy smoothie. It’s very filling without being too thick of a smoothie and has a great smooth texture. This vanilla almond green protein smoothie is packed with protein, fiber, and potassium. It also will provide you with a variety of minerals and high amounts of vitamin A, B-6, C, D, and E.
Thoroughly wash and dry your spinach leaves. Then add this to your vitamix or other high speed blender. Also, add your cup of unsweetened almond milk, one tablespoon of almond butter, and your frozen banana to your blender. Note: By using unsweetened almond milk and only half of a banana, you can keep the sugar relatively low in this smoothie. This also helps to keep the total amount of carbohydrates down. Last, add your scoop of vanilla protein powder to your blender. Process on high for a minute or two, or until your smoothie is well mixed. This almond vanilla green protein smoothie will provide you with 250 calories, over 950 milligrams of potassium and 20 grams of protein. It will also give you 19 grams of your total carbohydrates, 5 grams being dietary fiber and 7 grams being sugar. In terms of vitamins, you’ll be receiving 20% of your daily vitamin B-6, 25% of your daily vitamin D, 35% of your daily vitamin C, 56% of your daily vitamin E and over 120% of your daily vitamin A. One serving of this smoothie will also give you a variety of minerals. Some of those include: 9% of your daily riboflavin, 14% of your daily iron, 31% of your daily folate and 55% of your daily calcium.